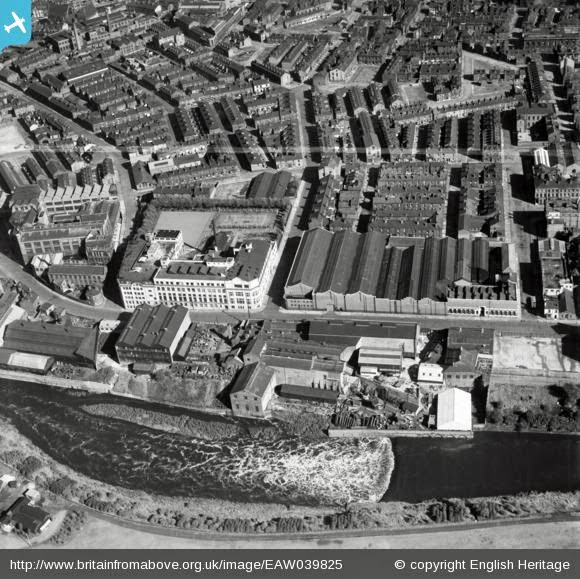 "THE CRESCENT AND THE ADELPHI BLEACH WORKS, SALFORD. 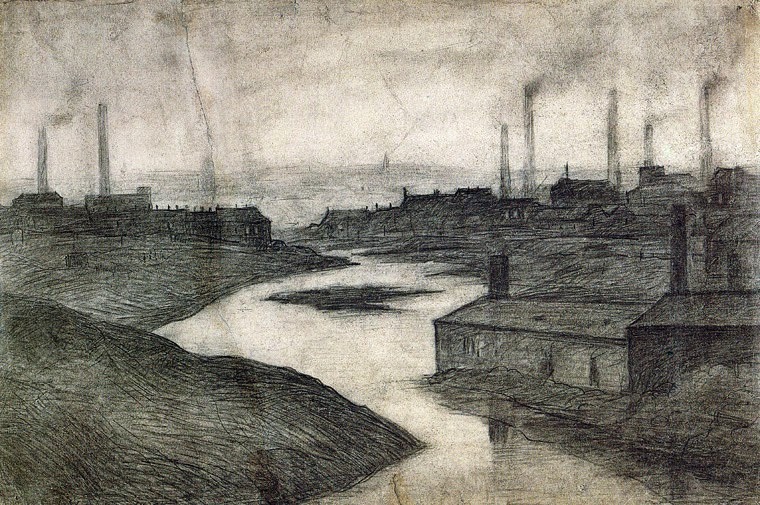 The accompanying engraving exhibits a portion of one of the most picturesque landscapes in the suburbs of Manchester. In its entire extent it embraces the seat of William Garnett Esq. and its surrounding grounds on the left the centre is occupied by the beautiful plain formed by an immense tortuosity of the Irwell studded with a windmill, a farm, straggling cottages, and numerous trees. In the distance are seen the rising grounds of Kersall and Broughton adorned with castellated chateaus, the Priory, and many a Gothic and Grecian villa and their appropriate pleasure grounds overtopping each other like the famed hanging gardens of the East; whilst on the right hand the river, dashing over the weir and the gardens in front of Adelphi Terrace, all conspire to arrest the attention of the passing stranger and amply justify the selection of the site of the extensive range of mansions styled the Crescent, the windows of which command this delightful prospect. 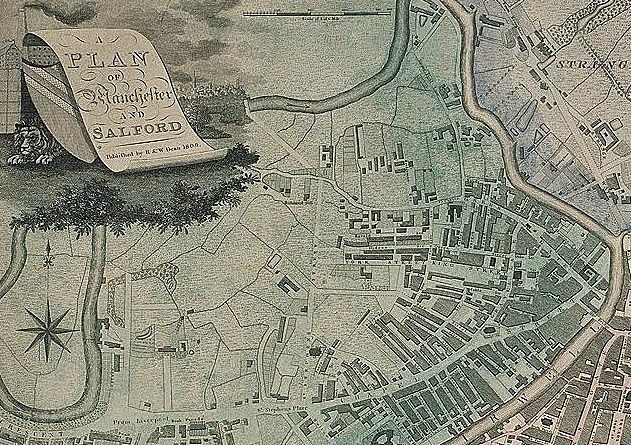 An attempt was made a few years ago to build over the land between the Bolton road and the river but the inhabitants wisely and successfully resisted it, and it is to be hoped that Salford will long retain this great ornament to the Township. It is deeply to be regretted that the same degree of public spirit did not, at an earlier period, interpose to prevent the erection of the numerous manufactories on the banks of the river. Valuable as the supply of water rendered the land on which the works stand, yet its admirable adaptation for extensive pleasure grounds, and its proximity to the Royal Salford Dispensary and to St Philip's Church, --both of which might easily have been rendered contributory to its architectural adornment, --point it out as the best possible situation for one of the public gardens which have been proposed to be opened in large and crowded towns. It is, however, too late now to discuss its merits; but there can hardly be a difference of opinion as to the importance of securing the estate of Lark Hill, and some portion of the adjoining central plain, for so desirable an object whenever it maybe practicable -- always remembering that when such an opportunity is lost, it will probably be lost for ever. 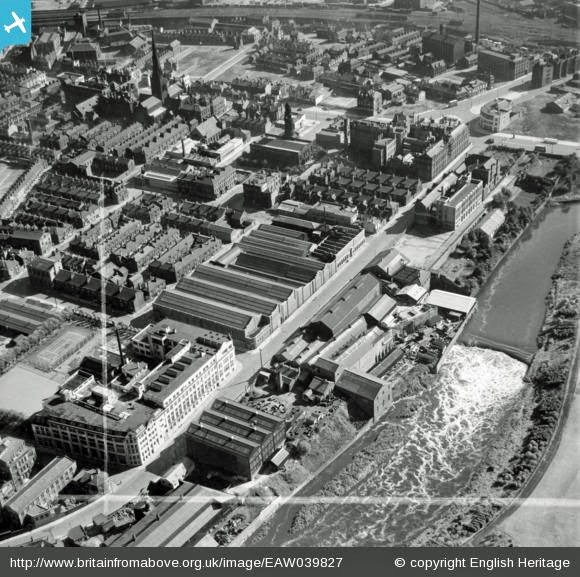 The factory described as the Adelphi Bleach Works was more commonly known as the Crescent Bleach Works . 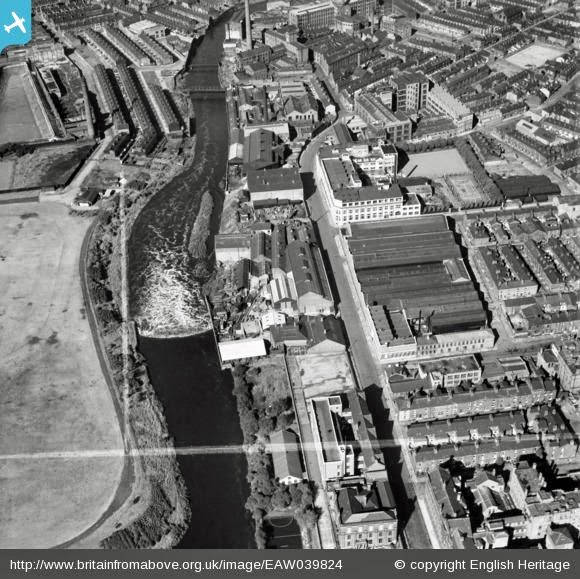 It should not be confused with the Adelphi Dye Works, located further down the river (see map below). 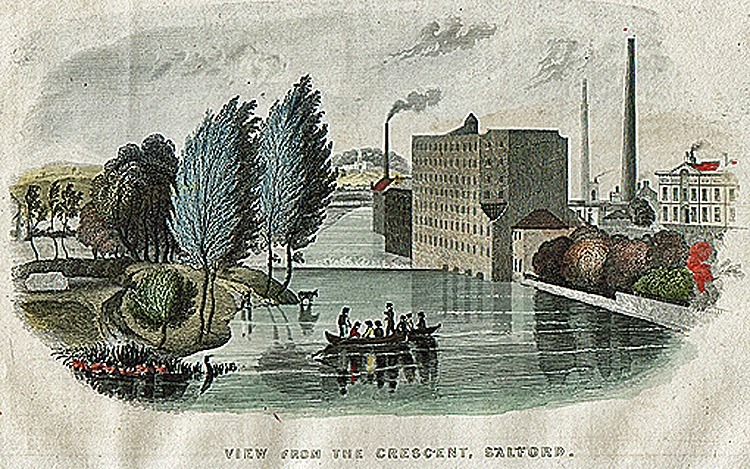 The weir, clearly shown in the illustration, is outside the Crescent Bleach Works. In the preceding quotation, we see the effects of the Industrial Revolution (1770s to 1840s), particularly the encroachment of the industrial complex onto what had been rural farmland. During this period, the population of Great Britain trebled, with mass migration from the countryside to rapidly expanding cities. This was accompanied by unparalleled social change, most notably the rise in the disparity of wealth between an impoverished working class, who inhabited urban slums, and the wealthy and influential industrialists, living in their 'castellated chateaux' and 'Grecian villas'. When the economics of this situation became strained, it resulted in the Peterloo Massacre. The map above was drawn from a survey conducted by William Green, which began in the year 1787 and was completed in 1794. 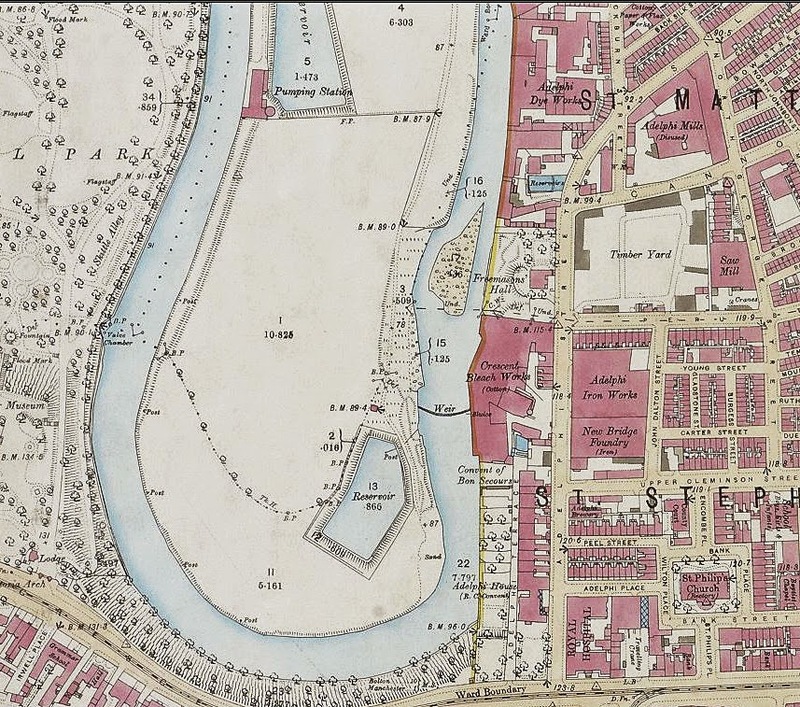 It shows the pre-industrial crescent and adjacent Adelphi area, with the Earl of Derby and Holland Ackers as major land owners. The weir is present, built in 1793 to serve the needs of the adjacent water-powered Bank Mill, which was the only factory on this stretch of the Irwell at the time. Bank Mill appears to have been a cotton spinning and a grinding mill. 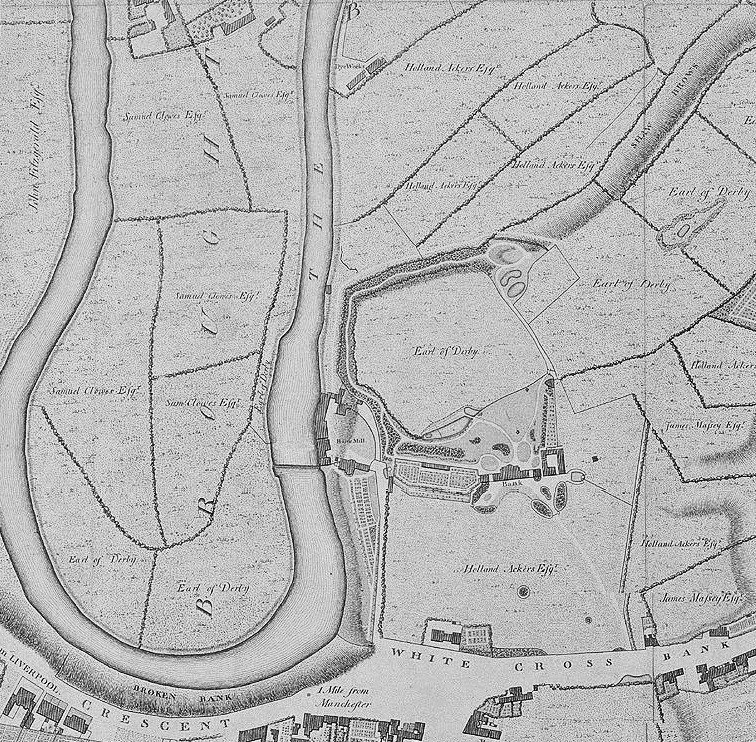 As early as 1740, the Adelphi area was called "Bank", hence the name of the mill. Bank House, with its gardens  and tree-lined avenue, was the home of Holland Ackers, and was located near the mill. grinding logwood, used in making dyes, . 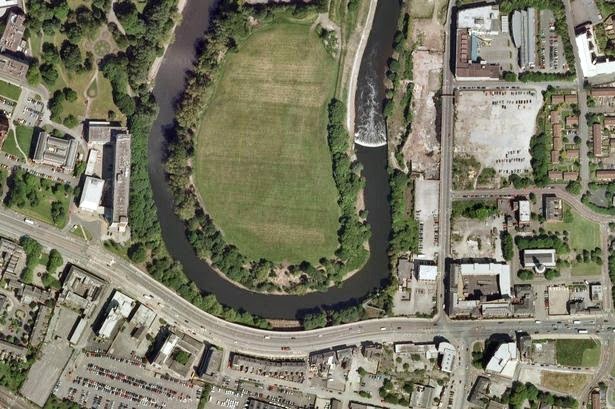 The following four images are aerial photographs of the Adelphi area, showing the River Irwell, the weir and the adjacent site of the Crescent Bleach Works and Bank Mill. They were taken on 15 September 1951. 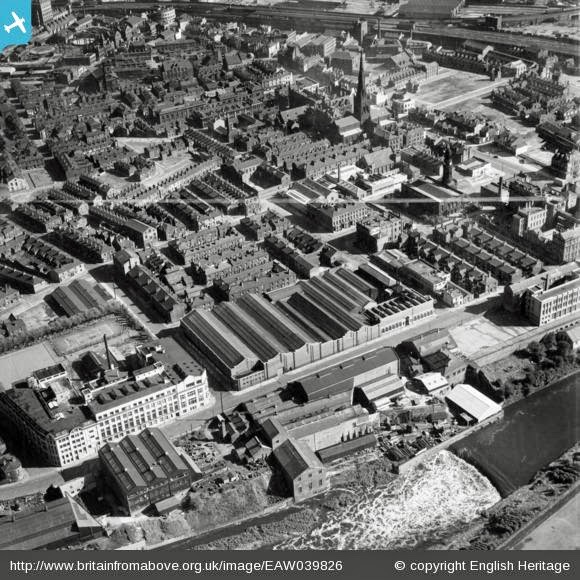 The source of the photographs is Britain from Above. Since the above aerial photographs were taken, many factories have been demolished, and the area is becoming residential. The article continues with a description of the processes involved in the bleach works. Source: Bradshaw's Manchester Journal. Volume 1 (no. 16: 14 August 1841). 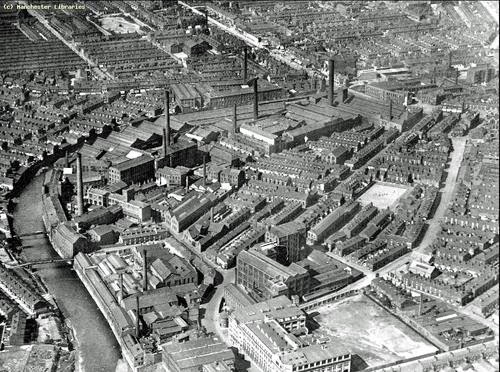 The Crescent Bleach Works was owned by Robert Heywood of Bolton. Robert Heywood came into possession of the works when its owner, James Slater, went into foreclosure. 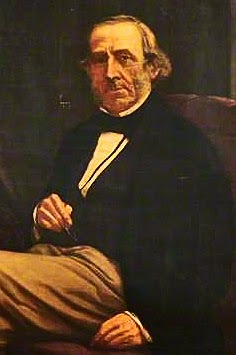 John Heywood managed the firm until, in 1822, when Charles Darbishire became his partner, and took charge of the running of the Crescent Bleach Works. Redding, C. An Illustrated Itinerary of the Lancashire London, 1842. 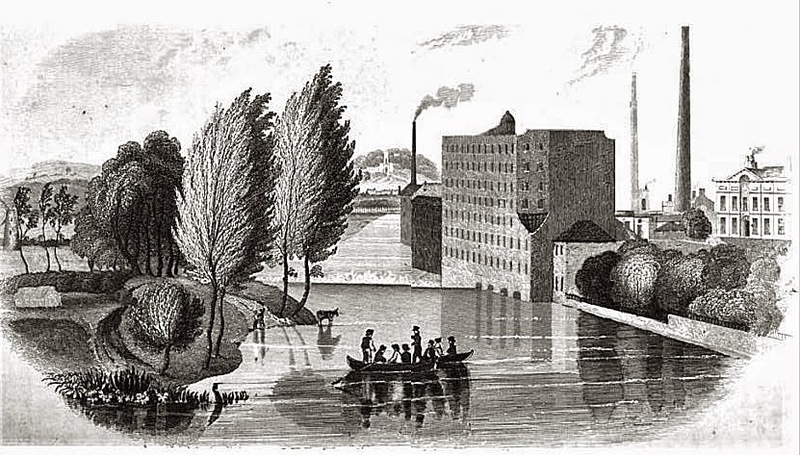 In 1782, Holland Ackers, Jonathan Beever and Joseph Ramsbottom established Bank Mill. Ramsbottom, a cotton manufacturer, died in 1791. His wife, Martha, continued to represent the interests of her family. 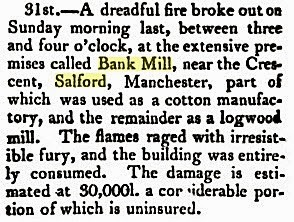 Subsequent to probate, the property was described as the 'corn, wood and cotton mills at Bank, near Manchester.' 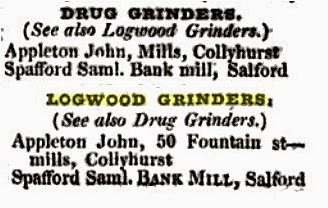 The following names are associated with Bank Mill. 1804 January 3: Partnership between James Ackers and Jonathan Beever dissoved due to retirement of the latter. 1809 the lease of Bank Mill, Salford by James Ackers to John Seaton, John Fox Seaton and Robert Seaton, Bankers of Pontefract, who leased Bank Mill for a rent of £700 per annum. The mill was involved in spinning cotton. 1818-1819 Martha Tongue Logwood grinder. She died 1 June 1819. 1820 18 July John Arrowsmith, Manchester Innkeeper takes 99 year lease. 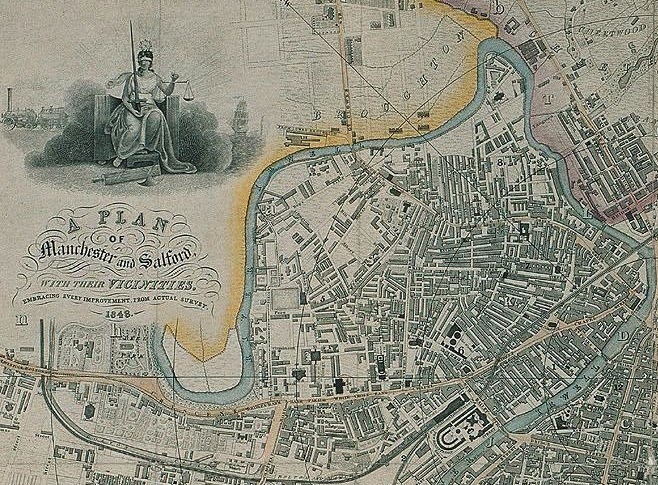 1827 25 May John Arrowsmith leases land adjoining Bank Mill and water wheel to James Slater of Bolton. 1828 25 September Benjamin Williams as trustee of the will of James Ackers agrees to repairs at Bank Mill and allows the construction of a chimney. [This chimney was partially destroyed by a hurricane in 1839]. 1833 Benjamin Williams as executor of the will of James Ackers (deceased) assigns lease of Bank Mill with all machinery to James Ackers of The Heath near Ludlow. 1839 Bank Mill owned by Thomas Bury (dyer) Thomas Bury and Co. : "dyers, calenderers, and finishers". 1848 Record of title to James Ackers to property at Bank Mill and the Adelphi, and to water privileges from the Irwell adjoining the land. See: Uings, Joy. Gardens and gardening in a fast-changing urban environment (PhD thesis, Manchester Metropolitan University, 2013): 187-188.